Artist's impression of possible development of the Southern Gateway in Chichester (photo submitted). The next steps for a major redevelopment project for Chichester’s Southern Gateway have been revealed this week. A masterplan for the area, which stretches from the city’s law courts to Canal Wharf, was approved by Chichester District Council in November 2017. Since then the council has been negotiating with Stagecoach and Royal Mail about relocating the bus depot and sorting office, while work on a development brief is set to start and be completed by the autumn. 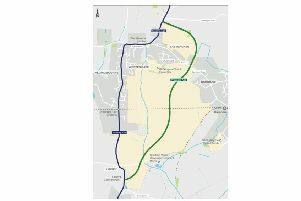 The council would then seek a development partner for the project, which includes new homes, offices, restaurants, bars, cafés, leisure and entertainment facilities, as well as major alterations to the road layout. Site studies for the land have been completed, a soft market testing exercise demonstrated plenty of interest from developers in the Southern Gateway project, while lawyers have also been appointed to provide advice. Meanwhile the district council is also continuing to work with the other public sector landowners, Homes England, which will take control of the court sites once they are completely vacated, and West Sussex County Council. While the masterplan was intended to be a flexible document, the development brief will ‘put a bit more flesh on the bones’, according to Paul Over, CDC’s executive director and deputy chief executive. The brief is essentially a landowner’s offer to the market about what it wants to see built and would be more descriptive than the masterplan. Developers then make pitches as to what they believe could be brought forward on the site within the parameters of the brief. Mr Over said the Chichester Vision had identified the need to calm down traffic, provide more facilities for young people, as well as encourage university graduates and young entrepreneurs to stay in the city, things which could all be addressed through the Southern Gateway project. This could be done through high quality office space providing new jobs and smaller housing units. Meanwhile redevelopment of Canal Wharf could include new restaurants to create a destination area, especially during the evenings. He described how the custody centre could be added to the scheme at a later date as it is due to close, but the police station will remain open. Although Network Rail land north west of the railway station is not included in the first part of the scheme, improvements would be made to the public areas around the station entrances. The land south of Kingsham Road would be the most suitable for housing with that part of the scheme most likely to come forward first. Leisure and entertainment facilities are a major focus of the Southern Gateway scheme, which would likely be located where the court buildings are now. Selecting one developer partner would ensure the improvements and facilities the community wants are delivered as well as the more profitable parts of the redevelopment such as the housing. Tony Dignum, leader of the council, said ‘steady progress is being made’ and described how such a complex project involving a number of public sector organisations took time but ‘a lot of work is going on behind the scenes’. He added: “Work on the Southern Gateway project is progressing well. The project aims to provide complementary facilities to the rest of Chichester and Mr Dignum argued it would ‘transform the southern part of the city’. As well as providing around 365 homes and 20,000 square metres of business floor space, he hoped the final scheme would include a new hotel on top of leisure facilities. Meanwhile public realm improvements and road layout changes would make the approach to the city centre ‘more attractive’. After being awarded £5m from Government through the local enterprise partnership, the project is still looking to secure more funding. Proposals for closing the two level crossings and providing a road bridge over the railway line have proved popular with residents, but have been rejected by the council. But Mr Dignum reiterated the council could not obtain the amount of public funding needed to build a bridge, and argued the access ramps would be too long, intrusive to neighbouring properties and would harm the character of the city. The current plan would see the Stockbridge Road level crossing restricted to buses, emergency service vehicles, pedestrians and cyclists with alterations made to Basin Road and the Southgate gyratory. For more information on the Southern Gateway project visit the council’s website.